Our cattle are grass-fed and grain-finished on our family farm! No antibiotics, hormones, or implants during the feed process. Available in quarter, half and whole quantities and ready each year in late summer/early fall. The following is an estimated guideline of the what you can expect to receive with a quarter beef. Any cuts you do not want will be put into Ground Beef. Dry-aged primal cuts is now an available option! Dry-aging beef is a process that takes several weeks. At the beginning of processing, the meat begins to dehydrate as the enzymes start to tenderize the muscle tissue. The end result being extra tender and more intense flavor. 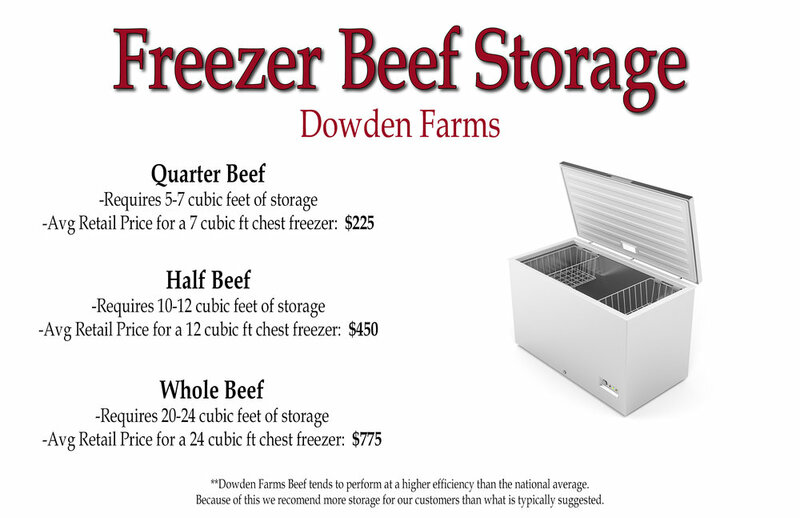 Adding dry-aging to your primal cuts when you order will increase your final processing cost. This also means that the non-primal cuts part of your order will be ready approx 2 weeks earlier than the dry-aged cuts. You can pick-up your order at two separate dates from the processing facility. They will notify you when each part of your order is ready. If you are not local to the processing facility then we will work with you on arranging a more convenient schedule for pick up! Still have more questions? Get in touch with us! We are always willing to answer any questions. Now Offering a Payment Plan! For those who prefer not to pay the deposit all at once, you now have the option to make payments! There is no weekly or monthly requirement. Pay as little or often as you like, from $25 to $2000. Deposits must be paid in full by the deadline in order to guarantee a spot on our schedule.